Do you need a short-term Plan of Action to kick-start your business? You already have crystal clear what you want to achieve in the coming 90 days in terms of income, revenue, volume? Just need to work it out? Check out this Plan of Action template. Working with this 90-Day Plan enables you to create a strategy, that with consistent activity, can create new growth and momentum. In order to rapidly manifest your needs, you need to get clear on paper exactly what it is that you want. This template will help you structure and plan your thoughts on every detail in a professional way! Our Templates are helping you to reach the next level of success in your work and business. Fast, safe and easy! 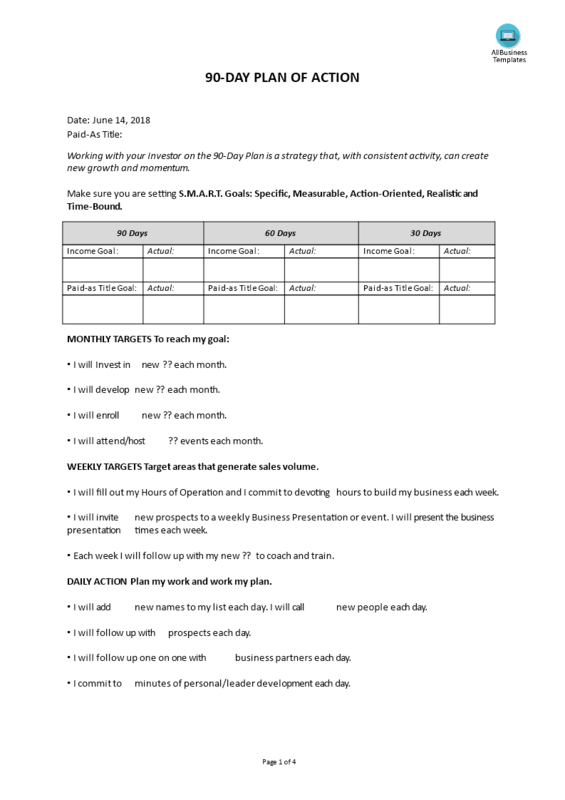 Download this 90 Day Plan Of Action template now!